The Introspection Machine is an interactive environment for visual feedback. The machine consists of six modules, each of which has a flexible, manipulable “eyestalk.” At the end of each eyestalk is a large rubber suction cup, which permits it to adhere to any of the six displays in the installation. The machine’s modules transform the video input from their manipulable eyestalks into supple and organic dynamic displays. By redirecting these eyestalks, users can explore an unbounded space of continuous light, complex forms, and surprising relationships. The machine’s reconfigurable eyestalks comprise the principal interface by which participants interact with the installation. These playful stalks, which pipe pure light and information from computer to computer, make it possible for the video output from one reactive display to be used as the input for another. An Introspection Machine module may even be piped back to itself, creating a tight loop of visual recursion. As visual material from each display is reinterpreted by the others, pools of light shift and mutate based on the connection, configuration and movement of the stalks’ suction cups. 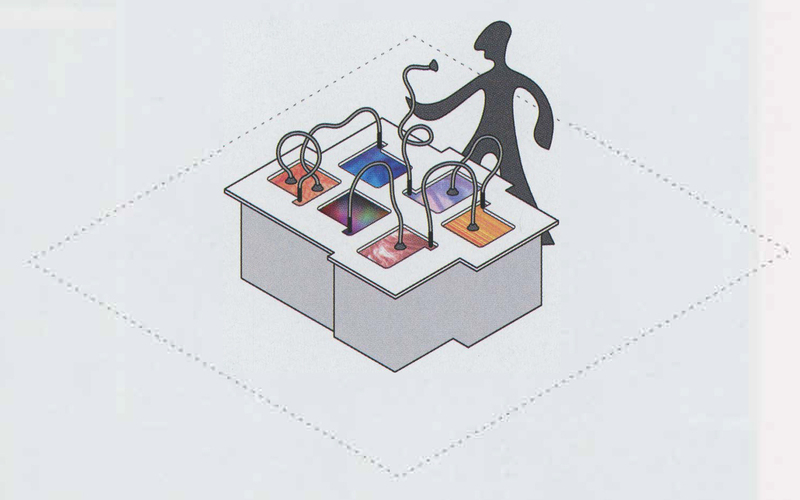 As a display system for fluid colors and forms, The Introspection Machine can be thought of as an interactive light fountain, in which participants liberate the “water” welled into each monitor by physical conduits of video information. As a complex feedback system, on the other hand, The Introspection Machine has analogies to a wholly visual brain, whose cybernetic intelligence is derived from the principle of feedback itself.